What animal is an expert thief and wears a mask as a disguise? If you guessed raccoon, you’re right. 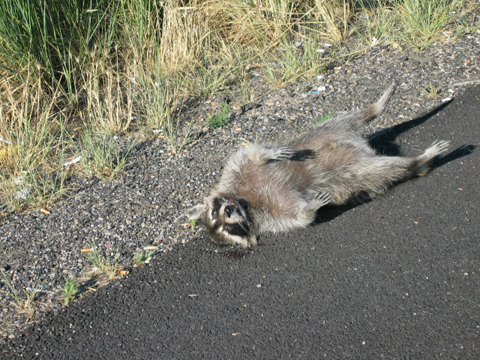 Raccoons live throughout the United States. They live in forests and woodlands, but they also live near farms and even in cities. Because they’re so smart, they can adapt to different areas. Raccoons are about the size of a medium dog. 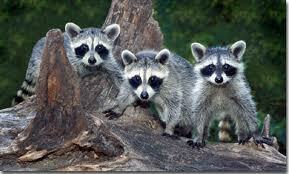 More all about raccoons, they have a bushy, ringed tails and a black mask across their faces. They look cute, but they are wild animals. Raccoons are about the size of a medium dog. They have a bushy, ringed tails and a black mask across their faces. They look cute, but they are wild animals. They can bite and scratch and some carry diseases. Raccoons are omnivores. They eat almost anything. Raccoons are omnivores. They eat almost anything, including clams, fish, nuts, fruit, lizards, insects and the occasional squirrel or mouse. Raccoons can get into trouble with people. They dig through trash cans or compost bins. They eat dog food and might even crawl under your house or into openings in the attic. Raccoons love raiding vegetable gardens. They knock over cornstalks to get the corn and devour small melons! Raccoons are nocturnal. They are awake during the night and sleep in the day. 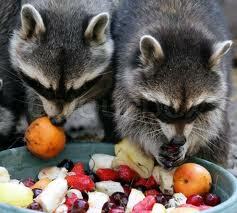 Most raccoons only live two or three years. Some are hit by cars. Others are eaten by predators or get sick. Apart from the US raccoons can be found in Canada and parts of Mexico. 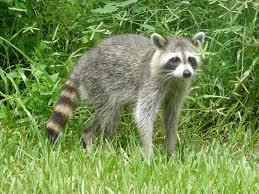 Raccoons have predators such as; Coyote, Bobcat, Cougar, Dog and large birds of prey like Eagles and Owls. 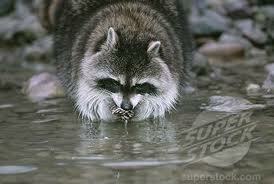 Raccoons often dip their food in water, but scientists don’t think they are washing it. They probably just like the feeling of the water on their paws. Raccoon moms usually have two or three babies, called kits. Raccoon moms keep their babies safe. A short informational video about raccoon facts. Question: Do raccoon moms take care of their young? Answer: Raccoon moms usually have two or three babies, called kits. Raccoon moms keep their babies safe in dens. After two or three months, the babies start exploring. By 6 months of age, they’re ready to go out on their own. Question: Do raccoons wash their food? Answer: Raccoons often dip their food in water, but scientists don’t think they are washing it. They probably just like the feeling of the water on their paws. Enjoyed the Easy Science for Kids Website all about Raccoons info? Take the FREE & fun Raccoons quiz and download FREE Raccoons worksheet for kids. For lengthy info click here. Declan, Tobin. " Raccoon Fun Facts for Kids ." Easy Science for Kids, Apr 2019. Web. 23 Apr 2019. < https://easyscienceforkids.com/all-about-raccoons/ >.